How high is too high and how can you lower it? A desirable level of total blood cholesterol in adults is 200 mg/dL or less, according to the American Heart Association. Blood cholesterol levels from 200 to 239 mg/dL are considered borderline high; levels of 240 mg/dL and above indicate high blood cholesterol levels. Why should you care? The higher your blood cholesterol, the higher your risk of developing heart disease or having a heart attack. Cholesterol is a waxy, fat-like substance in your blood and in all the cells of your body. 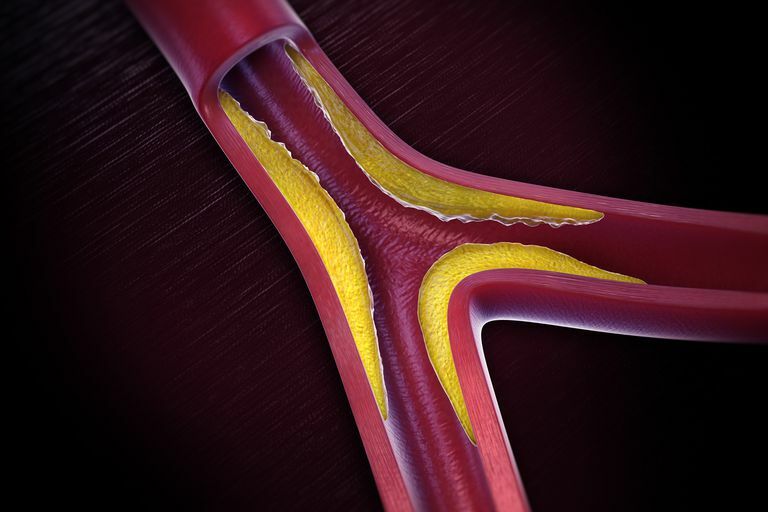 When it builds in the inner walls of your arteries, it hardens and turns into plaque. That plaque can narrow the artery walls and reduce blood flow, which can cause blocks that can lead to blood clots, heart attacks, or strokes. Here's the surprise: Your body actually needs cholesterol to stay healthy, and it's entirely capable of making all the cholesterol it needs. What can cause trouble is a diet of less-than-ideal foods and, in some cases, your family health history. Low-density lipoprotein (LDL) cholesterol: When too much LDL ("bad") cholesterol is present in your blood stream, it can clog your arteries and put you at risk for a heart attack or stroke. It’s produced naturally by the body, but is also inherited from your parents or even grandparents, and can cause you to create too much. Eating a diet high in saturated fat, trans fats and cholesterol also increases your level of LDL. High-density lipoprotein (HDL) cholesterol: High levels of HDL ("good") cholesterol removes excess plaque from your arteries, slowing its buildup and helping to protect against a heart attack. Low levels, however, can actually increase your risk. The higher your HDL number is the lower your risk of developing heart disease or having a heart attack. Triglycerides: A form of fat made in the body that circulates in the blood. High triglycerides may raise the risk of coronary heart disease, especially in women. If you have an inactive lifestyle, a diet high in carbohydrates, smoke, are obese or drink too much alcohol, it can raise total cholesterol levels, and lead to high LDL and low HDL levels. Your diet. While saturated fat in your diet is the main source that may cause your blood cholesterol levels to rise, cholesterol in food sources is also important; reducing theses dietary sources of cholesterol can help to lower your blood cholesterol levels. Your weight. If you are overweight, your risk for heart disease and high blood cholesterol is greatly increased. If you lose weight you can lower your LDL and total cholesterol levels and help to increase your HDL and reduce your triglyceride levels. Being physically inactive. Another risk factor for heart disease, as well as a contributing factor in being overweight, is a lack of regular physical activity. Regular physical activity helps to lower LDL and raise HDL cholesterol. According to a report on a new study of diet and exercise by the National Academy of Sciences, Institute of Medicine one hour of physical activity is now recommended to reduce health risks. Because other factors such as age, gender, and heredity are things you cannot change, controlling your diet, weight, and amount of physical activity are even more important. The fact is that the older we get the higher blood cholesterol levels will rise. Women are particularly susceptible to the age factor since before menopause total cholesterol levels are lower than men of the same age; however, post-menopausal women often see an increase in LDL levels. You may also be genetically predisposed to high blood cholesterol levels since high cholesterol can run in families. Smoking cigarettes. If you smoke, stop; if you don't smoke, don't start! High blood pressure. If your blood pressure is 140/90 mmHg or higher or if you are already taking blood pressure medication, you are at increased risk for heart disease or heart attack. Low HDL cholesterol. HDL levels of less than 40 mg/dL increase your risk; while HDL levels of 60o mg/dL or higher do not increase your risk of heart disease or heart attack. Family history. If your family history includes heart disease in your father or brother before age 55 or heart disease in mother or sister before age 65, your risk is increased. Age. Men who are 45 and older and women who are 55 and older face significant risk of developing heart disease or heart attack if their cholesterol levels are high. Although being overweight and/or physically inactive are not included in this list they are factors which must be considered and corrected. There are a number of ways your health care provider can help you to lower your LDL level enough to decrease your risk of developing heart disease or having a heart attack including Therapeutic Lifestyle Changes (TLC) which is a special cholesterol-lowering diet plan that includes physical activity and weight management. Some patients may require cholesterol-lowering drug treatment in addition to TLC. The TLC diet is a low-saturated-fat, low-cholesterol diet that includes less than seven percent of calories from saturated fat and less than 200 mg of dietary cholesterol daily. The number of calories allowed on the TLC diet is individualized based on the number of calories needed to lose weight or maintain weight while avoiding weight gain. Sometimes reducing saturated fats and dietary cholesterol is not enough to lower your LDL enough and increasing the amount of soluble fiber may be necessary. Other foods that contain plant stanols or plant sterols such as cholesterol-lowering margarines and salad dressings can be added to the TLC diet to further help boost the effectiveness of the TLC diet. The TLC Diet guide can be accessed for free as a .pdf booklet to read online or print out or can be ordered in print form from the National Heart, Lung and Blood Institute of the National Institutes of Health. "High Blood Cholesterol," NHLBI, National Institutes of Health. "Your Guide to Lowering Cholesterol with Therapeutic Lifestyle Changes (TLC)," NHLBI, National Institutes of Health.